I recently bought myself two presents: Jeni’s Splendid Ice Creams at Home by Jeni Britton Bauer and The Perfect Scoop by David Lebovitz. And since I knew I would be trying lots of ice cream recipes, I decided to declare the beginning of the week “Ice Cream Sunday”. I probably won’t post every week, and I’m sure I won’t write about all the recipes I try. But I do want a place to record my adventures so I can keep track of what I liked, what I didn’t, and what I might do differently next time. It all started when I decided to host Ice Cream Week earlier this Summer. A full week of ice cream recipes — how bad could that be? I had picked my recipes, made all five of them, and written the blog posts., Then I discovered this recipe. A lot of my friends had made Jeni’s recipes, and they all raved about how good they were. So even though my Ice Cream Week recipes were in the bag, I decided to try a Jeni recipe. Saveur had a bunch of them on its website, and I pinned several to my Ice Cream board. Although they all looked good, I quickly settled on this recipe. Not only do I love black raspberries, the idea of making ice cream with sweet corn was just too strange and intriguing to pass up. I generally don’t post recipes when I’m making them from a published cookbook, but this one is readily available online, so I’ll share it here. To make raspberry sauce, bring black raspberries and 1/2 cup sugar to a boil in a 1-quart saucepan over medium-high heat. Continue to boil, stirring occasionally, until thick, about 8 minutes; strain and chill. To make ice cream, in a small prep bowl, stir together 2 tablespoons of the milk and the cornstarch to make a slurry. Set aside. In a medium bowl, whisk cream cheese and salt until smooth. Set aside. Cut kernels off cob of corn and cut cob into large chunks; reserve kernels and cob together. In a 4-quart saucepan, whisk together remaining milk and the cream, sugar, and corn syrup; add corn kernels and cob and bring to a boil over medium-high heat. Cook and stir for 4 minutes. Remove from heat and whisk in slurry. Return to a boil over medium heat and cook, stirring with a heatproof spatula, until thickened, about 2 minutes. Pour mixture through a fine strainer into a bowl and discard corn solids. Gradually whisk hot cream mixture into cream cheese until smooth. 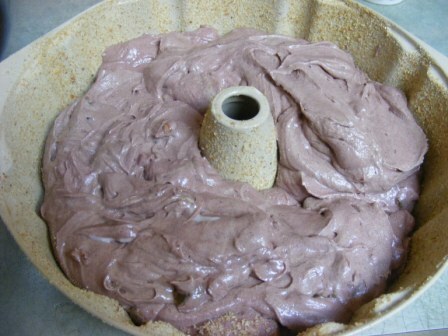 Cover bowl and refrigerate mixture until well chilled, preferably overnight. Or to quick chill, pour mixture into a gallon-size zipper seal bag and submerge in ice water for about 30 minutes. Churn base in ice cream freezer according to manufacturer’s instructions. Layer ice cream and black raspberry sauce in storage container. 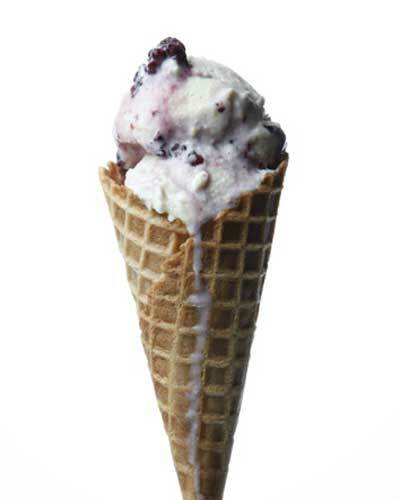 Press a piece of parchment or wax paper against surface of ice cream and freeze until firm, at least 4 hours. This ice cream is insanely good. The sweet corn gives it a silky texture and an almost vanilla-like flavor. And the blackberry sauce adds visual appeal and a nice sweet-tart finish. I can’t wait to try more of Jeni’s ice creams. And I haven’t even cracked open David’s book yet. 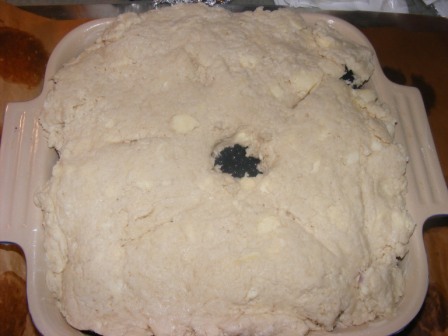 This week’s Modern Baker Challenge recipe is Blackberry Jam Cake, a cake that was popular in the 19th century but which is relatively unknown today. 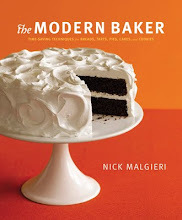 I’m not sure when or why this cake fell out of favor, but I applaud Nick Malgieri for bringing it back to the modern kitchen. This is a delicious and simple cake that, as Nick says, deserves to be better known again. To make the batter, I began by creaming butter and sugar, then adding eggs. Next, I mixed flour, cocoa, allspice, cinnamon, and baking soda in a bowl. 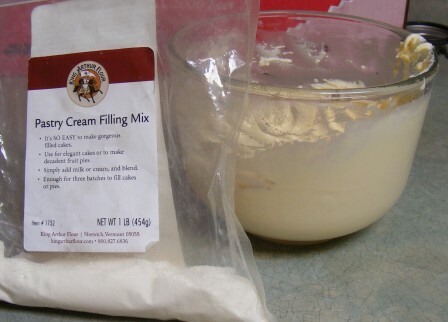 I then added the flour mixture and buttermilk to the butter mixture, alternating between the wet and dry ingredients. Finally, I stirred in blackberry jam, raisins, and walnuts. I scraped the mixture into a Bundt pan that had been buttered, sprinkled with bread crumbs, and sprayed with cooking spray. I baked the cake for about an hour, until it was firm, well risen, and baked through. We ate this cake plain, and it really didn’t need any accompaniment. 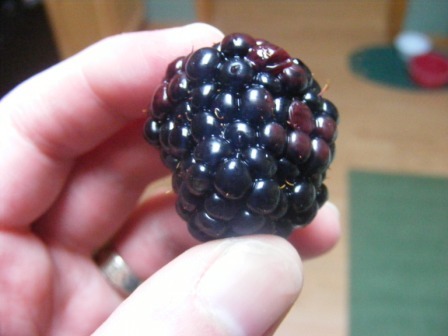 If you wanted to dress it up, a few sugared blackberries would be really nice. 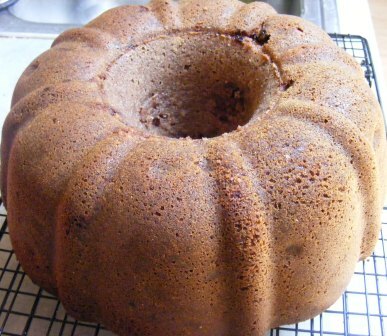 This cake was delicious — the blackberry jam infused the cake with a sweet, rich flavor without being overpowering. And the cocoa added depth and color to the cake. The spices lent a warmth to the cake that made it seem like it would be perfect for late fall or winter, although we enjoyed it in the heat of summer, too. This is a wonderful cake that I will be sure to make again when the heat of this crazy summer breaks and the leaves start to turn. In fact, it might just make an appearance at Thanksgiving this year. This recipe and post are part of the Cakes section of the Modern Baker Challenge. Margaret was the official blogger for this recipe. Check out her blog to see how she liked it. This week’s French Fridays with Dorie recipe is very, very French. No, it’s not laden with butter and wine. Nor is it some ultra-fancy dish you’d expect to find in a 5-star restaurant. No, what makes this dish French is gelatin. You see, unlike Americans who grew up eating Cool Whip and fruit mixed with Jell-O and who now can’t stand the sight of anything called “Fluff”, French home cooks see unflavored gelatin as any other cupboard staple. They use it to hold together meringues or thicken mousse. 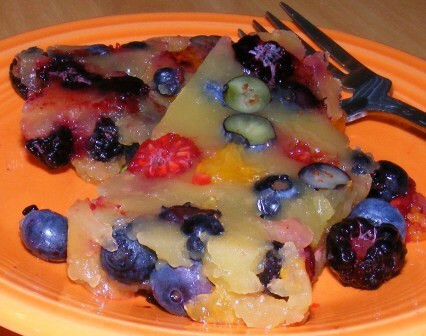 And in the Summertime, they mix it with fruit juice to make refreshing, light fruit desserts, like this one. This is one of those recipes that is meant more as a jumping off point than a set of strict instructions. 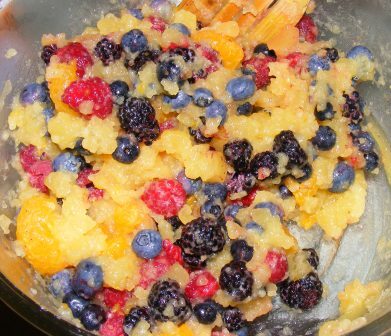 With the basic gist of the recipe — citrus juice thickened with gelatin surrounding fresh berries — you could make any number of tweaks, based on your mood, what’s in season, or, as in my case, what you have in the refrigerator. 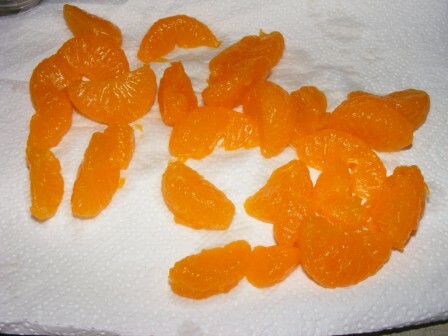 The recipe starts with instructions to make supremes of orange slices and set them aside to dry a bit, which I did. OK, you caught me. My supremes look a little too perfect, don’t they? In my first slight departure from the recipe as printed, I drained a can of mandarin oranges, rinsed off the syrup, and dried them on paper towels. I couldn’t see taking the time to make supremes when I had pre-supremed oranges in the cupboard. I didn’t have any grapefruit, canned or otherwise, so I left those out of the recipe. The next step was to soften two packets of unflavored gelatin in water. I had recently been to the bulk food store, and I bought powdered gelatin there, so that’s what I used. There was a sign on the bin indicating that one tablespoon of bulk gelatin equalled one packet of gelatin. I would come to find out that this was not the correct proportion (it should have been 2 1/2 teaspoons of gelatin), but more on that later. 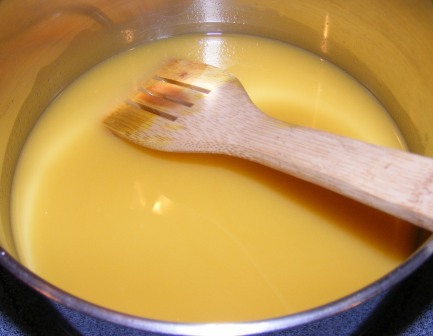 While the gelatin softened, I mixed two cups of orange juice with a small amount of sugar and brought them to a boil. In the time it took the sugar and juice to boil, the gelatin coagulated — my first clue that something was amiss with my proportions. Rather than mix the juice into the gelatin in the bowl, I ended up scraping the gelatin into the saucepan and heating it until it softened up. 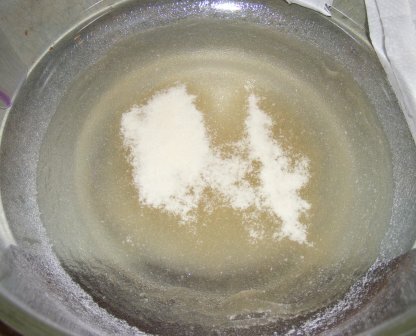 The recipe says to put the juice mixture in the fridge for about two hours, stirring occasionally, until it firms up a bit and has the consistency of egg whites. I forgot to stir the juice mixture, and after about 1 1/2 hours, it was completely firm, like set Jell-O. This was when I knew the measurement for the gelatin must have been off. Undeterred, I took the mixture out of the refrigerator and beat it with a whisk until it broke up as much as it was going to; then I mixed in the fruit. At this point, I knew things had gone way off track, and I had no idea if the mixture would reset and hold together or if I would be eating it out of the pan with a spoon. But it tasted fine, so I decided to chance it. I spread the mixture in a loaf pan, covered it with plastic wrap (which I used to press it into the pan as tightly as I could), and put it in the fridge overnight. The next day, I took the pan out of the refrigerator, anxious to see what sort of disaster I had created. I unmolded the terrine onto a platter, and to my surprise, it held together. So, how was it? Was I able to overcome my potluck fluff nightmares and actually enjoy this gelée? In a delicious word, yes. The terrine was light, cool, and fruity, perfect for the sweltering Summer weather we’ve been experiencing. And frankly, good enough to make anytime of the year with whatever fruits are available. This is definitely a recipe that surprised me. I thought it would be OK, but really expected nothing more than a Jell-O salad. It was so much better than that, but every bit as easy to make. This is a recipe I am certain to make again and again, with different juices and fruits. And unflavored gelatin will take the place of the sugary, artificially colored and flavored boxes of Jell-O in my cupboard. Talk about saving the best for last. This is the final recipe I made from the Sweet Tarts & Pies section of The Modern Baker, and what a way to finish! I would have to put this recipe in the top 3 for this section, right up there with the Pumpkin Pecan and Bourbon-scented Pecan Tarts. I put this one off until the end, not just because it’s near the end of the section (I tend to make the recipes roughly in order), but also because tartlets always seem a bit fussy to me. I tend to favor full-size tarts and pies, as their miniature counterparts tend to be tedious to assemble. I needn’t have worried with this recipe, however, as it came together really quickly. Having made the crust the day before to use for lemon lime tartlets, all I had to do was roll it out, cut it, and fit it into the mini muffin pans. 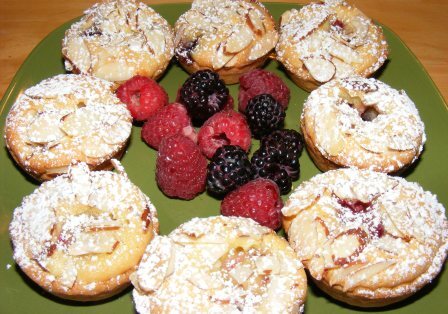 I had planned to make a half recipe of the lemon lime and raspberry almond tartlets, so I divided a single batch of sweet tart dough and set aside half for each recipe. There was a small chunk of dough leftover when I made the lemon lime tartlets, and I had stuck that in the fridge after I made the crusts for those the day before. As I rolled out the dough for the raspberry tartlets, I realized there was enough dough to make more than just 12 tartlets. 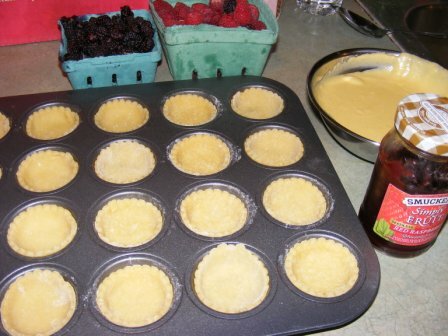 To my surprise, between the leftovers from the day before and the raspberry tartlet dough, I was able to make 24 tartlet shells. While the dough chilled in the fridge, I put together the filling, which consisted of almond paste, sugar, eggs, vanilla, butter, and flour, all whirred together in the food processor. 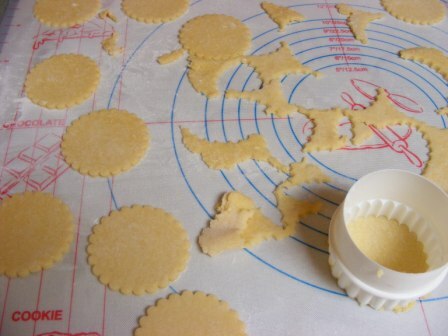 Then I gathered my ingredients to assemble the tartlets. 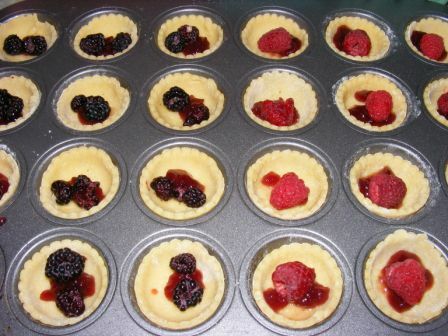 I began by putting a dab of seedless raspberry preserves in each shell, then topping that with either one large raspberry or two small blackberries. Then I spooned in the filling to cover the berries. Nick says to spread the filling evenly with an offset spatula, but mine seemed to even itself out nicely. 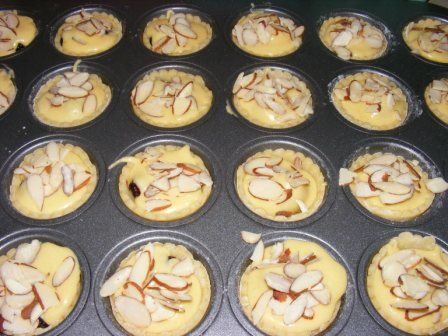 I sprinkled the top of each tartlet with sliced almonds, and they were ready to bake. 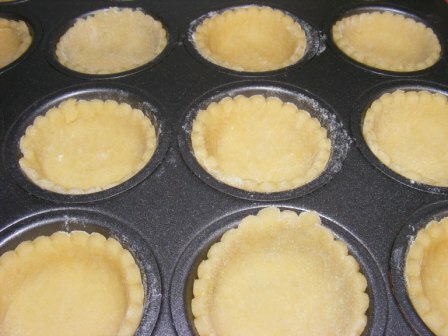 I baked the tartlets at 350°F for 20 minutes, until the crust was baked through and the filling was puffy and set. Allowing the tartlets to cool was no easy task, but I left them alone for about 25 minutes, until the pan was cool enough to handle, then I removed each tartlet to a rack to finish cooling. Well, all except for those destined for the dessert plate. In case you’re wondering, that wasn’t all for me. My wife and I split the tartlets on the plate. But I did sneak another one every time I walked past the table. And I found lots of excuses to pass through the dining room. I really enjoyed these tartlets. 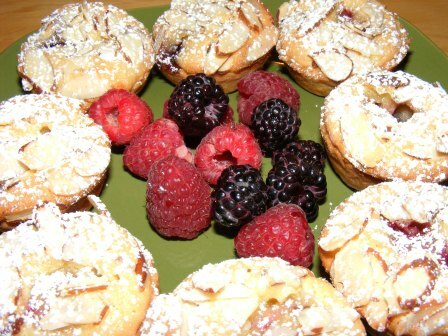 The almond paste gave the filling a wonderfully rich and warm flavor, while the berries provided a juicy, tart contrast. I liked the blackberry ones the best, although I wouldn’t say no to either of them. Which is why I eventually had to wrap them and put them away. So that’s it for the sweet tarts and pies. On to Puff Pastries. I hope you’ll come along for the ride. This is the first tart recipe in the Sweet Tarts & Pies section of The Modern Baker, and although I generally bake the Challenge recipes roughly in order, this was actually the 11th recipe I made from this section. We started baking from this section at the beginning of April, and I wanted to wait until the fruit at the grocery was a bit nicer looking before I made this tart. This tart has three components — crust, pastry cream, and fruit filling. Each one is fairly easy to put together. The recipe calls for press-in cookie dough for the crusts, so that’s what I used. Based on my previous experience with this crust recipe, I refrigerated the dough before pressing it into 4 1/2-inch tart pans. The chilled dough is much easier to work with, and chilling some of the dough while working with the rest keeps it firm enough to handle. I baked the crusts for about 15 minutes at 350°F until the crusts were nicely browned and baked through. The tart recipe includes a recipe for pastry cream, but I decided to take a shortcut and use King Arthur Flour pastry cream filling mix, which makes a rich, delicious pastry cream with no cooking or fuss. The fruit was also very easy to prepare. I made an apricot glaze by boiling strained apricot preserves and water, then reducing it by about one-third. 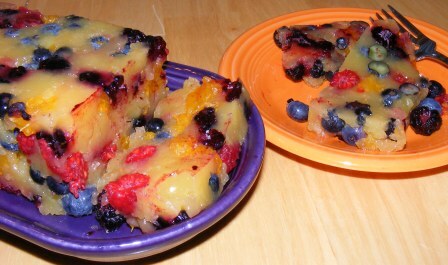 While the glaze was cooling, I washed, peeled, and sliced the fruit — kiwi, mango, blueberries, and blackberries. I had wanted to use fresh pineapple and strawberries, too, but I bought them too early and they weren’t in the best shape by the time I made the tarts. After layering the fruit in a bowl, I poured in the glaze, then mixed it all gently with a rubber spatula. 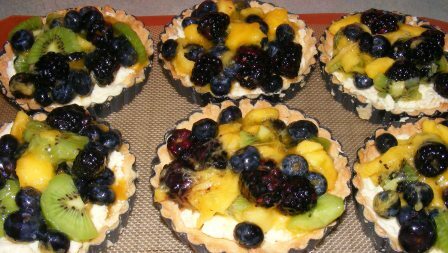 To assemble the tarts, I spread a layer of pastry cream in the shells, then piled on the fruit. 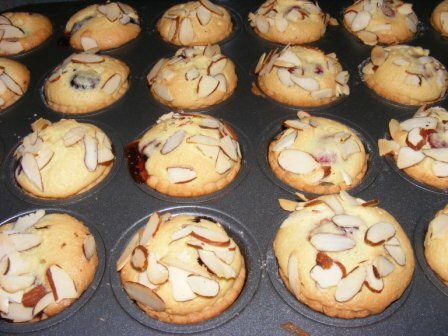 We absolutely loved these tarts. The crunchy cookie dough, creamy filling, and sweet-tart fruit all worked perfectly together. I will definitely be making these again and again for my family and friends. 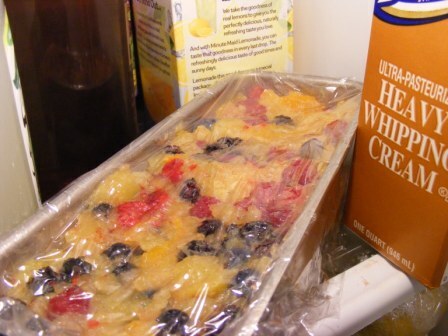 And since you can use any mixture of fruit you want, the possibilities are endless. If you grew up eating “fruit pizza” made with canned sugar cookie dough and cream cheese filling, you owe it to yourself to try the real thing. 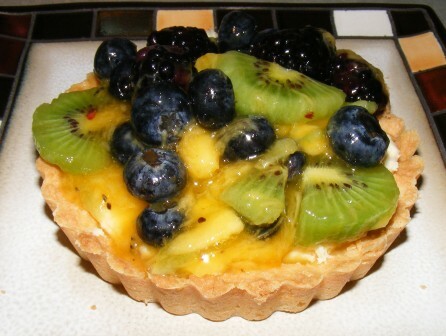 You’ll be amazed at how easy these stunning and delicious tarts are to prepare. You could also make this as a single large tart, like my friend Abby did, to take to a party or carry-in dinner. Either way, I guarantee it will make more of an impression than fruit pizza. I recently purchased Dorie Greenspan’s Baking: From My Home to Yours, which I have been dying to try out, and this seemed like the perfect opportunity. 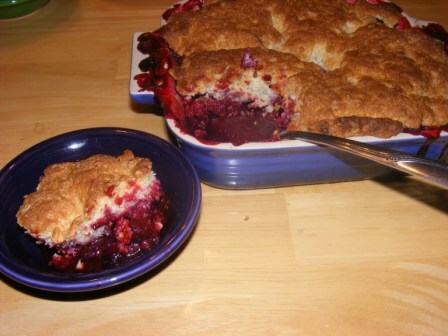 There is a recipe for mixed berry cobbler on pages 416-17. I’m a huge cobbler fan, so this sounded like just the ticket. I happened to have some blueberries in the fridge, which I thought would pair well with the blackberries. As with most cobblers, this recipe came together quickly, I mixed the topping ingredients — flour, baking powder, sugar, salt. butter, and cream — then tossed together the filling. The recipe called for berries, sugar, cornstarch, zest of lemon or lime, and black pepper. I didn’t have any citrus on hand, so I substituted a few drops each of lemon and lime oil. 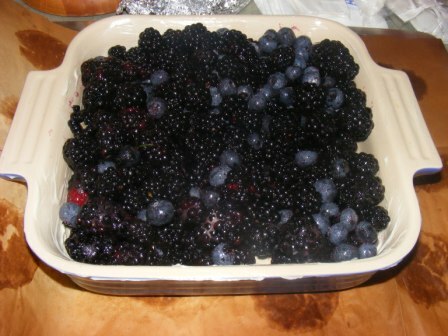 I went heavy on the sugar, as the blackberries and blueberries were both a bit on the tart side. I rolled the crust out to roughly the size of the pan, then put it on top of the fruit. I cut several slits in the dough, as well as a steam hole in the center. 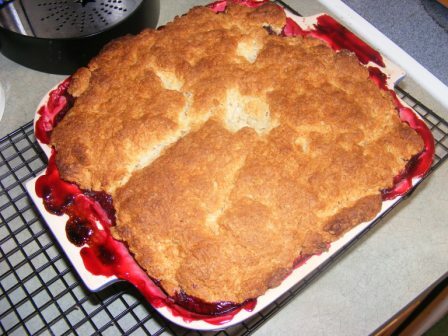 I baked the cobbler at 375° F for about an hour. It looked and smelled amazing. We waited to eat it until later in the evening, as we had company coming over. Everyone loved it, especially the citrus flavor. We all agreed that it had just the right balance of sweet and tart. This is definitely a recipe to repeat, and I think I’ll continue to substitute citrus oils for the zest.